#Tobywatch updates - will Toby from Cambridge hand in his notice if Solskjaer doesn't get the Utd job? Right then #Tobywatch fans (and football ones too, of course). Will we be faced with day 3 of #Tobywatch tomorrow? Who knows. Because I'm just as desperate as you all are to find out the news, I'll be keeping a close eye on the texts on 81111 throughout the evening. Thanks for your brilliant responses today and for getting involved. I'm sorry to leave you hanging. See you soon, and have a great evening! P.S. Toby, if you're reading this, and I'm sure you are, please give us an update before the end of the season. Ta. Having followed Toby since the start, I can't handle anymore cliffhangers!! Come on Toby, put us out of our misery! 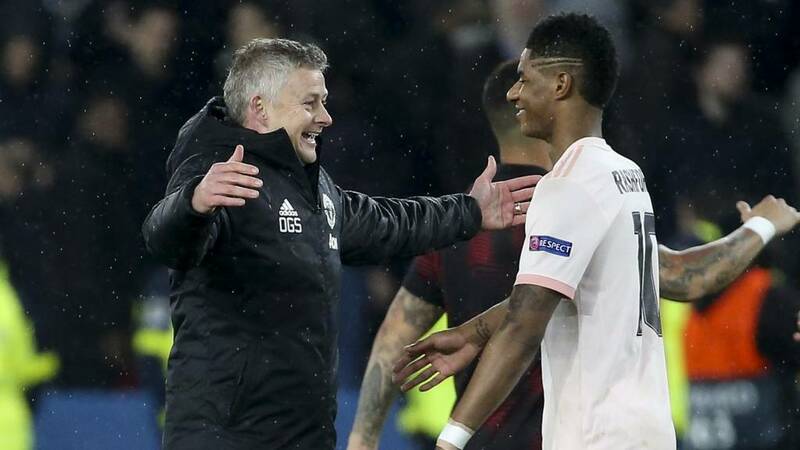 Manchester United interim manager Ole Gunnar Solskjaer will be appointed on a permanent basis by the club on half of the £15m salary of predecessor Jose Mourinho, according to the Daily Mirror. Sky Sports are reporting that former Chelsea, Leicester and Fulham boss Claudio Ranieri is favourite to take over at one of his former clubs, Roma, after the Serie A side sacked manager Eusebio di Francesco. And goal.com claim that former Manchester United manager Jose Mourinho is set to return to Real Madrid until the end of the season. Catch up on some gossip here. Liverpool defender Trent Alexander-Arnold says there is "no nervous tension" from his team in the Premier League title race, just an "eagerness" to succeed. The 20-year-old sat down with Match of the Day presenter Gary Lineker to talk about his dreams of becoming a Liverpool legend and lifting the World Cup with England. Chelsea have been denied a request to freeze a transfer ban while they appeal against the punishment handed out by Fifa. The Blues have been banned from registering new players until January 2020 for allegedly breaking rules over the signing of foreign under-18 players. But Fifa says it has denied provisional measures which would see the transfer ban frozen during the appeal process. Toby has clearly made a mockery of us all and just used these transfer rumours as a way to get a new bumper contract offered to him from his current work. Help us Gary, we're desperate!!! Phillippa: Loving all the #Tobywatch updates on #bbcfootball today! Chelsea midfielder Jorginho has praised the influence of his "amazing" mother on his career. Speaking on International Women's Day, the Italy international said it was his mother rather than father who drove his love of football as a child. A video of Maria Freitas breaking down in tears of joy after seeing shirts bearing her son's name in the Chelsea club shop went viral in August. "There are no words to describe her," he said. Manchester Ciity boss Pep Guardiola has been named manager of the month after his side won all four league matches. Eden Hazard and N'Golo Kante are likely to return on Sunday after manager Maurizio Sarri rotated his squad in the Europa League. Sarri has no apparent injury concerns, with defender Antonio Rudiger and striker Gonzalo Higuain also expected to be recalled following Thursday's 3-0 victory over Dynamo Kiev. Thursday's goalscorer Pedro could retain his starting spot on Sunday, but fellow winger Callum Hudson-Odoi may have to settle with a place on the substitutes' bench. I can confirm that I will be taking Toby to the airport after having a chat with him a short while ago, so many choices but knowing Toby as I do he will make correct choice. Liverpool defender Dejan Lovren could return to the squad on Sunday ahead of their match against Burnley after a two-month absence with a hamstring injury. Midfielder James Milner had been hampered by a muscle problem but is expected to be fit. Defender Joe Gomez, out since December with a fractured leg, is likely to return after the international break. Midfielder Alex Oxlade-Chamberlain, sidelined since April by a serious knee injury, makes his playing comeback for the under-23s at Derby on Friday. Rui Patricio will return for Wolves at Chelsea, manager Nuno Espirito Santo has confirmed. The goalkeeper was replaced by John Ruddy in Saturday's 2-0 win over Cardiff to give Ruddy game time before next week's FA Cup quarter-final with Manchester United. But the Portugal international will be in goal at Stamford Bridge on Sunday. "It was very clear. The decision was made and I was very clear in my intention," the Wolves boss confirmed. "I was pleased because John performed very well. John was very confident and he was very stable, which is what we were looking for. "Now we play Chelsea, we focus on this game." Now then. He's arrived. Not via video link or press conference style, but alas via a text.